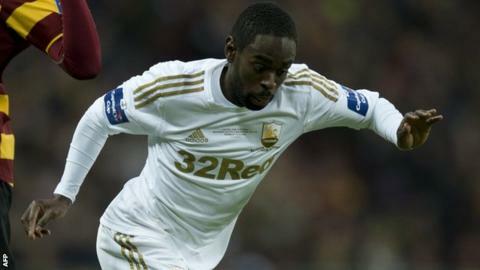 Swansea City winger Nathan Dyer has joined Leicester City on a season-long loan deal. The 27-year-old, who has been at Swansea since 2009, has fallen down the pecking order at the Liberty Stadium following the arrivals of Jefferson Montero and Andre Ayew. "The gaffer wanted me to help the team keep progressing," said Dyer. "I'll give the club everything I've got." He becomes Leicester's seventh signing of the transfer window. Dyer has made just one start for Swansea this season, in the Capital One Cup, and one substitute appearance in the league. He is one of two deadline-day departures from the south Wales club, with defender Dwight Tiendalli released from his contract.